Ok, this is going to be mushy silliness... but... I just LOVE Jenny at AllSorts... Remember she hosted A Post a Day in May, TWO months ago! (Doesn't seem that long!) Anyway... I always love her posts but look what she shared yesterday! Is that just the cutest? It's such a neat idea, I may steal it for above the changing table in the nursery. And she just started an Etsy shop called Loopsies, and sold her first batch of Dollypop's last week. I'm looking forward to see what she features there in the future. She's showed so many cute things on her blog that I just love. I'm planning on making her advent calendar this year, it won't turn out as cute as hers since I'm not quite a skilled seamstress, but I'll try! Oh, and these adorable elf shoes!!! Awesome. I think even I could manage the advent calendar. It reminded me of the tooth fairy pillow I made for Bay that has now been handed down and sits waiting for Bren's first loose tooth. I'll take a pic of it after I've mended his wiggly jiggly eye. 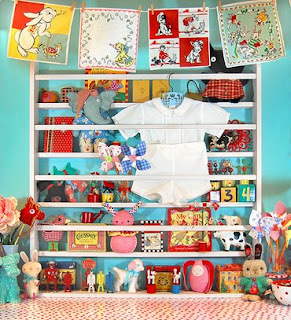 I love the "All Sorts" blog and will definitely be looking at her shop. Thanks for sharing. That's just what I was thinking too. *laugh* Will do, just send me your address :) I'll put them in the mail tomorrow! Ok.... I'm going to take you up on it girlie. I'll find some magnificent yummy here to send back. Wow, that is really cute! Thanks for the link. And thank you for your blog birthday wishes, I am so glad to count you among my blogging buddies!